Change things up with these side-trips from Cairns: Palm Cove (Hartley's Crocodile Adventures & Palm Cove Beach), Port Douglas (Safaris, Wildlife Habitat Port Douglas, & more) and Australian Butterfly Sanctuary (in Kuranda). Spend the 27th (Sun) among aquatic life with a scuba or snorkeling tour. Next up on the itinerary: hike along Esplanade Boardwalk, get your game on at Cairns Kart Hire Track, see the world from above with a helicopter tour, and appreciate the history behind Cairns Cenotaph. For other places to visit, more things to do, reviews, and more tourist information, go to the Cairns trip planning site . London, UK to Cairns is an approximately 23.5-hour flight. You'll lose 10 hours traveling from London to Cairns due to the time zone difference. Prepare for much hotter weather when traveling from London in October: high temperatures in Cairns hover around 34°C and lows are around 24°C. Cap off your sightseeing on the 1st (Fri) early enough to travel to Darwin. Darwin is known for museums, beaches, wildlife, theme parks, and zoos & aquariums. Your plan includes some of its best attractions: tour the pleasant surroundings at Mindil Beach, examine the collection at Museum & Art Gallery of the Northern Territory, enjoy the sand and surf at Lameroo Beach, and explore the striking landscape at Berry Springs Nature Park. To see ratings, traveler tips, maps, and tourist information, use the Darwin trip planner . Fly from Cairns to Darwin in 4.5 hours. Alternatively, you can drive; or take a bus. In November in Darwin, expect temperatures between 39°C during the day and 28°C at night. Wrap up your sightseeing on the 4th (Mon) early enough to drive to Katherine. Katherine is a town in Northern Territory, Australia. 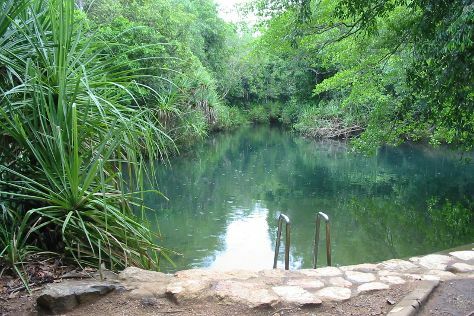 Kick off your visit on the 5th (Tue): experience rural life at Katherine Outback Experience, take in the natural beauty of Katherine Hot Springs, then take an in-depth tour of Katherine School of the Air Tourist Room, and finally take in the dramatic natural features at Katherine Gorge. Keep things going the next day: look for all kinds of wild species at Low Level Nature Reserve and then admire the sheer force of Edith Falls. For maps, traveler tips, ratings, and tourist information, use the Katherine trip itinerary site . Traveling by car from Darwin to Katherine takes 3.5 hours. Alternatively, you can take a bus; or fly. Traveling from Darwin in November, expect nights in Katherine to be about the same, around 29°C, while days are a bit warmer, around 44°C. Cap off your sightseeing on the 6th (Wed) early enough to travel to Alice Springs. Alice Springs is known for wildlife, museums, historic sites, nature, and parks. 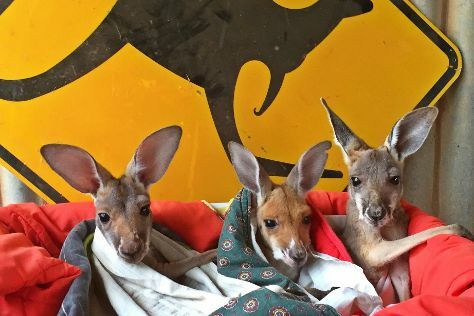 Your plan includes some of its best attractions: identify plant and animal life at The Kangaroo Sanctuary, take in nature's colorful creations at Olive Pink Botanic Garden, see the interesting displays at Hartley Street School Museum, and steep yourself in history at Alice Springs Telegraph Station Historical Reserve. To see reviews, more things to do, photos, and more tourist information, read our Alice Springs driving holiday planning site . Traveling by flight from Katherine to Alice Springs takes 4.5 hours. Alternatively, you can drive; or take a bus. Traveling from Katherine in November, things will get a bit cooler in Alice Springs: highs are around 40°C and lows about 21°C. Finish your sightseeing early on the 9th (Sat) to allow enough time to travel to Sydney. Get out of town with these interesting Sydney side-trips: Everglades Historic House and Gardens (in Leura), Wentworth Falls (in Katoomba) and Gallery Blackheath (in Blackheath). 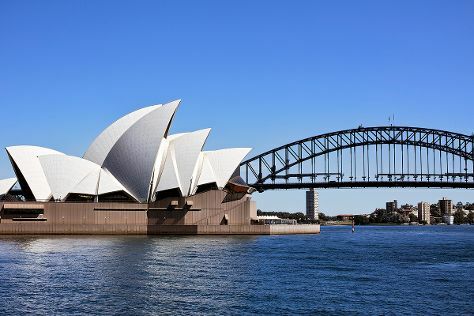 The adventure continues: catch a live performance at Sydney Opera House, tour the pleasant surroundings at Bondi Beach, admire nature's wide array of creatures at Sea Life Sydney Aquarium, and see the interesting displays at Australian National Maritime Museum. For maps, traveler tips, photos, and other tourist information, refer to the Sydney sightseeing planner. Fly from Alice Springs to Sydney in 5.5 hours. Alternatively, you can drive; or take a bus. Expect slightly colder weather when traveling from Alice Springs in November: highs in Sydney hover around 29°C, while lows dip to 19°C. Wrap up your sightseeing on the 16th (Sat) to allow time to travel back home.